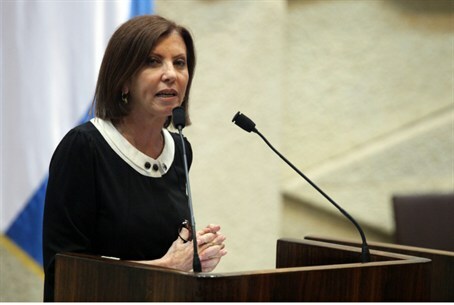 Meretz Chairman MK Zahava Gal-On intends to petition the Attorney General to stop plans from Minister of Construction Uri Ariel (Jewish Home) to house immigrants from France in Judea and Samaria. Ariel sent a letter asking the Yesha Council where the flow of immigrants from France could settle, as France reels from a string of anti-Semitic attacks. France led the list of countries from which Jews made aliyah to Israel in 2014, with almost 7,000 new French immigrants, more than double the 3,400 who came last year. Aliyah is only expected to increase after the latest spate of anti-Semitic attacks. Ariel ordered officials from the Ministry of Housing and Construction and the Israel Lands Authority to plan the expansion of Judea and Samaria communities, which have suffered multiple building freezes, to absorb immigrants. "There is no doubt that the French Jews feel deep sympathy with the settlement enterprise in Judea and Samaria," Ariel wrote, "and they may want to reside there." Gal-On vowed Wednesday to contact Attorney General Yehuda Weinstein to contest the plan, following a similar reaction from far-left Channel 2 commentator Amnon Abramovich. Abramovich argued that French Jews, who are already fleeing from a rising tide of Islamism in their home country, would feel distinctly uncomfortable moving to a region whereby the Jewish communities are surrounded by Arabs - and, often, villages with high levels of support for Hamas. France has seen a sharp rise in anti-Semitism in recent years, and it flared particularly in 2014 and during Operation Protective Edge, with violent protests in Paris. Labor leaders Tzipi Livni and Yitzhak Herzog further slammed the plan as a "cynical move that will hurt Israel's international standing" that will "deepen the isolation Bibi [Prime Minister Binyamin Netanyahu - ed.] got us into" and "deeply hurt our relations with world Jewry."